The outside of the Sagrada Familia, approaching its Nativity Façade, was extraordinary but somehow familiar. It has become Barcelona’s most famous landmark. But I was not ready for the inside. The soaring columns; the vaults like a giant forest canopy; the different coloured light coming in through the stained glass windows. This basilica seems little more than half-finished but it completely overshadows the city’s fine and (mainly) medieval cathedral. And that is evident from the numbers who go and see it. That sums up Barcelona very nicely. Last week was my first visit to the city. What struck me most was how at ease the place is with the modern. Two eras stand out. First was the later part of the 19th Century and early 20th. This was the when the Sagrada was started, and, in common with many major European cities, Barcelona exploded in size. The genius of architect Antoni Gaudi stands out, but the general self-confidence and exuberance of the architecture is striking. By comparison London building of the era seems obsessed with past forms, from medieval Gothic, to classical to, even, old Venetian architecture. Meanwhile Gaudi’s naturalistic forms foreshadowed Art Nouveau, and now look timeless. For much of the 20th Century, when Fascists and Communists held the initiative, brutal straight lines and right angles held sway, in an effort to show the superiority of human endeavour over the natural world – and Gaudi’s modernism looked whimsical and irrational. And yet there is nothing whimsical or irrational about natural forms. Gaudi’s architecture is functional and his forms resolve to simple mathematical principles. 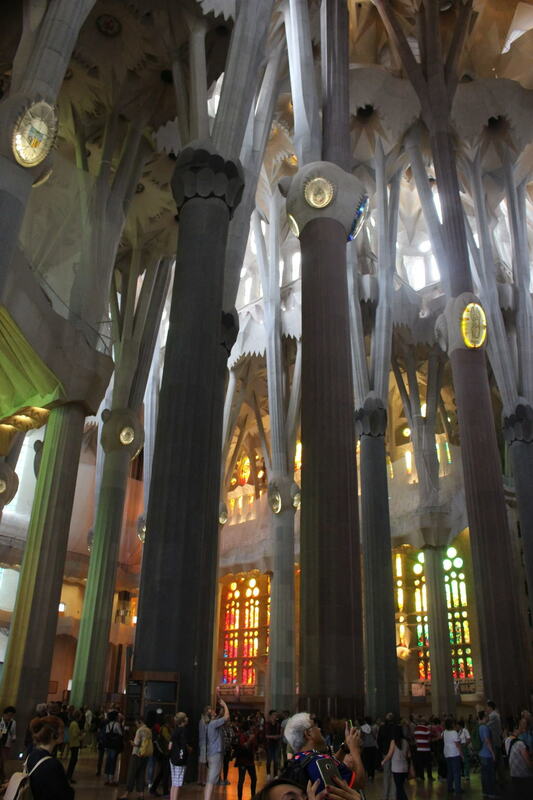 Nowadays we understand this better, and the Sagrada’s interior looks uncompromisingly modern. Such vision, lasting over such a stretch, is rare. London never truly embraced this sort of modernism. Paris dismantled much of its wonderful Art Nouveau pieces, like its Metro station entrances. Viennas’ Secession movement fared better, perhaps, but the surviving examples have the air of museum exhibits. Barcelona’s second period of modernist self-confidence started in the 1980s, after the pall of civil war and fascism was lifted, and was revealed to the world at the Barcelona Olympics of 1992. This second period has not ended. Apart from accelerated progress on the Sagrada, and its successful integration of Gaudi’s vision with modern engineering, there is a lot of confident modern work. This is most visible on the coastal part of the city. This stretches from the beach-side facilities and marinas with their focus on leisure, to the highly impressive modern port facilities. And in the suburbs there are modern residential areas, smart modern factories, and sweeping roads and bridges. Barcelona is an old city. At its heart there are ancient buildings and narrow medieval streets, all built on Roman era foundations. But I have not seen such an ancient place wear its modernity with such ease. What of Barcelona’s politics? It is hard for a tourist to say much based on a week’s visit, simply looking tourist sites. The Catalan independence flag, the Estelada, was everywhere though. The evident strength of the Catalan independence movement draws an obvious parallel with that of Scotland in the UK. But I was struck by its different historical origins. Catalonia is an older political entity than Spain itself, but has never had a period of full independence. Its spell as part of Moorish Al-Andalus was brief; its political origins were as a frontier region of Charlemagne’s Christian empire, and as such it looked to France for political and cultural leadership. This was not the case with all of modern Catalonia, it must be said, as the southern regions remained under the Moors for much longer, but it was true of Barcelona, which emerged as the area’s principal city. The connection with southern France was much diminished after the crushing of the Cathars in the 13th Century. Catalonia developed its own political structures in the medieval periods, including a proto-parliament, and became part of the wider political entity of Aragon. It flourished as a trading entrepot, until it was eclipsed by ports with better access to the New World. In the 15th Century, with the Moors being pushed back towards Granada, Aragon and Castile were united to form the basis of modern Spain. Spain in turn formed part of the wider Habsburg empire. These political entities were sensitive to local political structures,however – more resembling the union of British crowns under the Stuarts in the 17th Century than the United Kingdom of the Act of Union. But the Spanish Bourbon monarchy which replaced the Habsburgs in War of Spanish Succession, and in particular the crushing of Barcelona on 11 September 1714, after a long siege, brought an end to that. Catalan patriots date the era of Spanish oppression from this infamous date. Catalonia regained a degree of autonomy in the 19th Century during Spain’s political turmoil, and when industrialisation took off. This was crushed by General Franco’s Nationalists in the Spanish Civil War of 1936-1939. But, of course, the picture is complex one. Barcelona drew in migrants from all over Spain. Its cosmopolitanism no doubt contrasts with the rural conservatism of Catalonia’s Pyrenean villages. I can’t begin to predict how Catalonia’s future will play out. What I can say is that Barcelona’s modernism, and its whole feel, is very different from the rest of Spain. It feels closer to the heart of Europe. And it is a wonderful place to visit.